If someone says "Mars volcano," many might think of Olympus Mons, the lava-layered giant that lords over Tharsis. Yet on the opposite side of Mars, and as far south of the equator as Olympus lies north of it, there's a different kind of Mars volcano entirely. Where Olympus Mons rises more than 20 kilometers (12 miles) high, this one climbs only 1.8 km (1.1 mi) above its surroundings. Where Olympus Mons spreads to a diameter of 600 km (340 mi), this other volcano's dome reaches about half that distance. Where Olympus Mons is built of countless thin sheets of hardened lava, the other volcano arose through repeated explosive eruptions of cinders and ash. Finally, where Olympus Mons is comparatively young in geological terms, the other volcano started erupting early in Martian history. All in all, Tyrrhena Mons isn't a typical Mars volcano. Tyrrhena Mons lies on the northeast edge of the Hellas impact basin. It numbers among a handful of similar low volcanic structures (originally called paterae, after the Latin word for dish) in the cratered highlands next to Hellas. The others are Hadriaca (also on the northeast) and Amphitrites, Peneus, and Pityusa (all on the southwest of Hellas). By counting the number and size of craters on various parts of the volcano, scientists can estimate its age. (The longer a surface has lain exposed, the more impact craters it collects.) 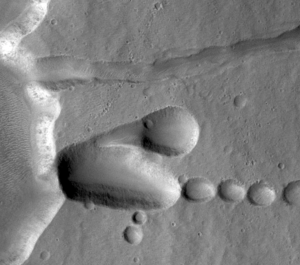 These studies show that Tyrrhena Mons was born 3.7 to 3.9 billion years ago, a date that followed soon after the Hellas impact, dated by researchers to about 4 billion years ago. Similar ages hold for the other volcanos near Hellas. Collectively, these are the oldest volcanos known on Mars. 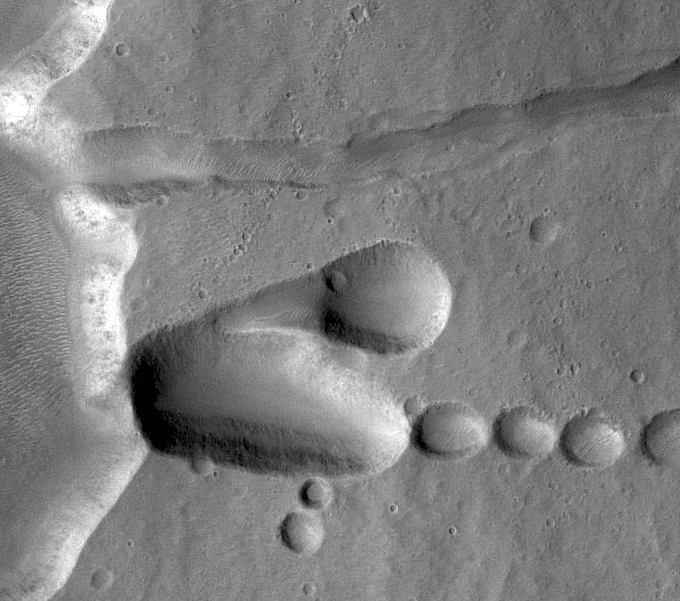 Tyrrhena and its neighbors also show a different volcanic style than later volcanos such as Olympus Mons and the others in Tharsis and Elysium. Tyrrhena's low slopes, wide structure, and heavily scored flanks suggest that it is made of easily eroded materials. Scientists call such volcanic debris "pyroclastic," from the Greek meaning fire-broken. Pyroclastic eruptions occur when hot magma reaches the surface full of gases or when it meets groundwater (or ice) near the surface. The result is a violent explosion of steam that blasts molten rock fragments and gases high into the air. Hot clouds of ash and cinders fall back on the surface and leave layers of debris. By zooming in on its details, we can glimpse some phases in Tyrrhena's evolution. The image above is a mosaic of infrared frames taken during daytime by the Thermal Emission Imaging System (THEMIS) on NASA's Mars Odyssey orbiter. Circling Mars every two hours, THEMIS scans the surface in five visible and 10 infrared bands. The smallest details it can record at infrared wavelengths are 100 meters (330 feet) wide; at visible wavelengths, THEMIS has imaged selected regions at 18-meter (59 feet) resolution. When molten rock pushed into the summit of Tyrrhena, the ground swelled and stretched, eventually creating a wide, shallow depression termed a caldera. On the flanks away from the caldera, the strain caused the surface to break open along concentric fracture lines. Possibly aided by the escape of groundwater (or melting ground-ice), many of the fractures opened initially as pits. These grew along the fault lines until they merged to form chains and eventually long grooves. Given the groundwater, magma, and resulting explosions, it's reasonable to wonder if the steam blasts caused local water clouds to form and for rain to fall out of the eruption cloud. It's possible, but if this happened the rain didn't last long enough to develop the kind of characteristic branching channels seen in rain-eroded landscapes on Earth.. It's more likely, scientists think, that escaping groundwater undermined the pyroclastic debris and etched broad, radial channels that cut into the volcano's flanks. These in turn were partly filled with lava (see next section). The variety of landforms and their interwoven relationships make it clear that Tyrrhena was not built in a single episode. Instead, researchers have identified three stages of activity. First, as previously noted, the volcano was formed between 4.0 and 3.7 billion years ago, soon after the Hellas impact. Then between about 3.7 to 3.3 billion years ago, the structure was was modified and resurfaced either by erosion or lava flows. These covered some areas and also produced the big channel from the caldera plus some of the radiating channels on the flanks. A final stage of resurfacing and modification for Tyrrhena came relatively recently in Martian history, between about 1.7 and 0.8 billion years ago. To put that last number in perspective, consider that by 800 million years ago, more than 80 percent of Mars' 4.56-billion-year history had already elapsed. And for comparison, the Tharsis volcanic region has areas resurfaced by lava even more recently. Those date from 100 to 300 million years ago — practically yesterday. When a lava-spewing volcano such as Olympus Mons (or Hawaii's Kilauea) erupts, tongues and sheets of molten rock creep down the flanks and cool in place. The result is a stack of hard basalt "pancakes," with each flow forming a distinct unit. A similar layering process occurs with pyroclastic eruptions, but the layers are typically thicker because the cinders and ash are porous and nowhere near as dense as a lava flow. When a pyroclastic eruption ceases, the material nearest the volcanic mouth is hot enough to weld together when it lands, but farther out the ash layer is thinner, looser, softer, less cohesive, and more easily eroded. Each new eruption throws another layered sequence on top of the previous ones. If we could slice down into the deposit left by a series of pyroclastic eruptions, it would be like taking a knife to a bakery torte. In nature, however, erosion works less neatly as it carves into the layers to reveal the various welded horizons that mark each successive eruption. In place of neatly exposed layers, after hundreds of millions of years of weathering, we find a series of stepped-back mesas like that seen in the closeup views at left and right. Tyrrhena's different form and eruption style, as compared to the more familiar volcanos in Tharsis, have led some scientists to propose that Martian volcanic activity changed in nature over the ages. There is also geochemical evidence that about 3.7 billion years ago, conditions at the Martian surface became more acidic. This happened, researchers think, due to a global increase in volcanic activity, which poured large amounts of sulfur dioxide gas into the atmosphere. Apparently, this occurred at roughly the same time that major eruption activity was winding down at Tyrrhena. What's the connection, if any? Maybe none. Maybe the volcanic centers near Hellas shut down because they had exhausted most of the magma available. And perhaps by that time, for unrelated (and unknown) geophysical reasons, volcanic activity was stirring to life in other parts on Mars. The fact is, no one really knows. In any case, Tyrrhena Patera and its cousins stand as puzzles that challenge us to understand the complex geologic history of Mars..
As fractures opened near the summit of Tyrrhena Patera, the ground collapsed to make pits and chains of pits aligned with the fractures. The large pit seen here is about 400 m (1,300 ft) deep. This view, some 12 km wide, is a portion of THEMIS VIS image V16535001. A trickle of lava flows down the volcano's north flank on top of the pyroclastic debris making up most of the volcano. It appears that Tyrrhena changed its style from pyroclastic eruptions to lava flows later in the volcano's history. This view, 10 km wide, is part of THEMIS VIS image V31709005. As erosion, probably from escaping groundwater (or melting ground-ice), cut into the volcano's pyroclastic material, it produced landforms that echo the canyons and mesas of the southwestern U.S. The ledges emerged as more resistant layers because they became weakly welded together when the pyroclastic debris was hot. This view, 8 km wide, is part of THEMIS VIS image V16223002.